Genius savant of the kitchen or prime time celebrity chef? Reclusive restaurateur or headline hunting publicity junky? Creator of enduring culinary masterpieces or peddler of generic, celeb-endorsed Italian grub? 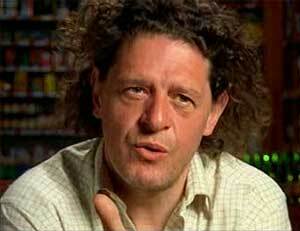 The truth is, at some point in his thirty year career, 46 year old Marco Pierre White has been all these things. As a young apprentice from a working class family of chefs in Leeds, White displayed the flair in the kitchens of culinary legends including Albert Roux, Pierre Koffman and Raymond Blanc that would make him at the age of 32, the youngest Brit ever to win three Michelin stars. He first came to national prominence in 1987 when Egon Ronay gave him a rave review as head chef of the seminal Harvey's in Wandsworth (now Chez Bruce). Classic dishes such as tagliatelle of oysters and pigeon en vessie were captured in the influential White Heat cookery book, along with White's gaunt, straggle-haired "Jagger of the Aga" persona in photographer Bob Carlos Clarke's iconic portraits. While White wowed foodies and guides alike, winning the modestly proportioned neighbourhood restaurant two Michelin stars (and at the same time training numerous future culinary stars including Gordon Ramsay), the mercurial chef soon became better known for throwing members of his celebrity-packed customer base out on the street and for his 15 week marriage to model Lisa Butcher. The spotlight returned to White's cooking skills in 1995 however when Michelin bestowed a third star on The Restaurant in the Hyde Park Hotel, the grand dining room he opened in partnership with hotelier Rocco Forte just 18 months earlier. He repeated the trick in 1998 with the even more opulent Oak Room at Le Meridian in Piccadilly. At the same time as becoming a three star chef, White was also becoming a restaurateur, opening the trend setting Canteen restaurant with actor Michael Caine and renowned London restaurant operator Claudio Pulze in Chelsea Harbour in 1992. Since then, numerous London restaurants including The Criterion, Mirabelle, Drones, Quo Vadis, The Belvedere and L'Escargot have at various times come successfully under White's control with a succession of business partners, many of whom White no longer speaks to. White's only certified failure to date has been the fate-temptingly named Titanic restaurant and bar near Piccadilly Circus which sunk without trace in 2002. In 1999 in a headline-grabbing, dramatic move White "handed back" his stars to Michelin and retired from the professional kitchen. His restaurant empire remains a very movable feast, but currently includes the likes of Marco at Chelsea football ground, Luciano's in St James, London and The Yew tree pub in Hampshire. In additon, he has struck an unlikely business partnership with celebrity jockey Frankie Dettori to open the Frankies chain of middle-market Italian restaurants in London and Dubai. He has also put his name to The White Room restaurant aboard the Ventura cruise ship.". Although his tempestuous third marriage and bitter divorce from former Canteen waitress Mati Conejero continues to make headlines, Marco appears to be successfully transforming himself from firebrand chef to cosy household name. In 2007, after shunning television for most of his career, Marco followed in the footsteps of Gordon Ramsay (a former close friend to whom he no longer speaks) and fronted ITV's reality game show Hell's Kitchen. He has since signed a £1m deal with the network and is currently appearing in Marco's Great British Feast. Later this year, he is due to appear on the American show The Chopping Block. His autobiography White Slave (aka The Devil in the Kitchen) was published in 2007. It's not easy to sum up Marco Pierre White so far, but maybe the George Best of the kitchen comes close; a prodigious talent who retired too early and has frittered his time away on projects that arguably haven't done his true abilities full justice. But even if there'll never be another Harvey's or The Restaurant, there's still time for one of the most successful and influential British chefs of all time to put a few more in the back of the culinary net. Andy Lynes is a freelance writer specialising in food, drink and travel - see andylynes.com for more info. 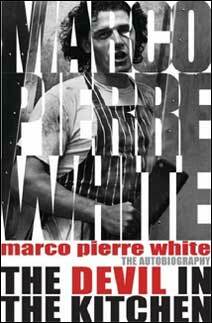 If you want to know more then Marco Pierre White's autobiography The Devil in the Kitchen is is well worth reading.